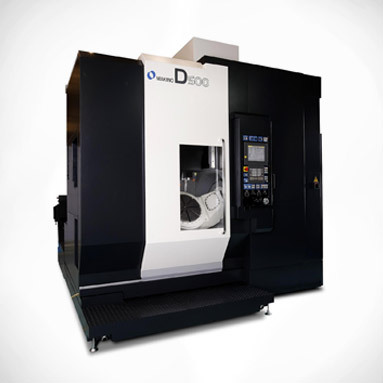 The D500 is the newest addition to Makino’s family of 5-axis vertical machining centers for the aerospace market. This new machine platform is designed for complex production—where part quality is paramount. The D500 work zone will accommodate up to a 650 mm diameter and a 500 mm tall workpice. The X-, Y- and Z-axes provide strokes of 550 mm, 1000 mm and 500 mm, respectively. The integral tilt and rotational axes provide tilt of +30 to -120 degrees on the A-axis and a full 360 degrees on the C axis. The D500 is capable of feed rates of 32 m per minute on the X – axis and 40 m per minute on both Y and Z axes. Three direct-drive motors provide the speed and accuracy for both the C-axis rotary table and A-axis trunnion. One direct-drive motor controls the C-axis rotation and two direct-drive motors, located at each end of the trunion, control the tilt of the A axis. The dual-motor design provides greater torque and rigidity, eliminating twist and torsion to achieve superior dynamic accuracy. The ultra-high torque DD motors also provide superior acceleration and high speed feed capability to compliment the quick X-, Y- and Z-axes motion characteristics slashing cycle times for complex 5-axis simultaneous machining applications by up to 60 percent. To insure tight thermal control, the D500 is equipped with a separate machine element temperature controller that maintains constant control of the operating temperature for various machine components. The DD motors incorporate cooling jackets to control heat, all of the ballscrews are core – cooled and the spindle carrier is also thermally stabilized. Even all of the machine castings are wrapped with a thermal insulation material to minimize the impact of changing shop environment temperatures on the precision of the machine. The D500 is equipped with a very productive, 14,000 rpm spindle providing outstanding stiffness and rigidity over a wide speed range. An oilmatic unit assures a closed loop relationship between the spindle operating temperature and that of the machine castings – creating a stable, controlled, highly accurate machining zone. In addition, the D500 can be configured with optional spindle configurations ranging from 20,000 rpm to 30,000 rpm affording productivity in high speed machining applications. The D500 incorporates the Makino Professional 5 Control which offers the perfect blend of a Windows CE graphical user interface (GUI), touch-screen selection offering instant access to information literally at your fingertip, user-friendly, efficient PC-like capability for data management and editing and the networking and storage capability of a data center. Also featured are Makino’s proprietary, next generation Super Geometric Intelligence (SGI.4) software and a variety of control enhancements for improved 5-axis machining performance. These features include Tool Center Point Control (TCP), Tilted – Work Plane (TWP), 3D Cutter Compensation, and Rotary Table Dynamic Fixture Offsets (DFO). Dedicated user-friendly screens simplify the overall application of 5-axis machining. Easy-to-apply functions are included to prevent interference between the spindle and trunnion during automatic operation to improve risk-free production. The ergonomics of the D500 provides great operator access to the worktable for setup purposes or tool and part checks - with a ceiling opening to allow convenient overhead crane access to the machine work zone. Configured with either an integral table or an interchangeable pallet, the machine can be readily integrated with a pallet changer or a robot access door for more dedicated automated part handling. The pallet changer configuration can be easily incorporated into a Makino MMC2 pallet handling system providing for hours of unattended machining operation. Radical Departures is the only publication that serves the aerospace industry exclusively.